One of the things that makes me confident in the inevitable triumph of the pro-life cause is the poor quality of arguments that poor-choicers have used to defend their stance. First they said that a fetus is not a human being. Which is bunk. Then they said he was not equal.Which means that not all human beings are equal. Which undermines their own progressive stance. The only thing left for feminists to argue are the consequences of legal abortion. But choose any consequence of illegal abortion (real or imagined), and it's never as evil as inflicting death on an innocent human being, which is what abortion does. They say women will be jailed for being pregnant and addicted to drugs. Killing an innocent human being is a worse evil. They say women will be jailed for having miscarriages. (Bunk). Even if it were true, killing an innocent human being is a worse evil. Women have lawyers. They can vote and lobby legislators to stop such practices. The unborn have no such power. They say women will die from coat hanger abortions. Bad as that evil is, it's a self-inflicted evil, and completely avoidable. Women can simply choose to undergo abortion. 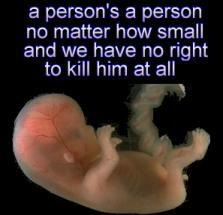 Unborn children have no such power. Examined logically and dispassionately, pro-life arguments always trump. Unfortunately, many people argue from a place of self-interest. They don't care for truth or morality. They only care that their self-interest is not affected. We don't need everyone to be dispassionate and logical about abortion. We only need a critical mass.